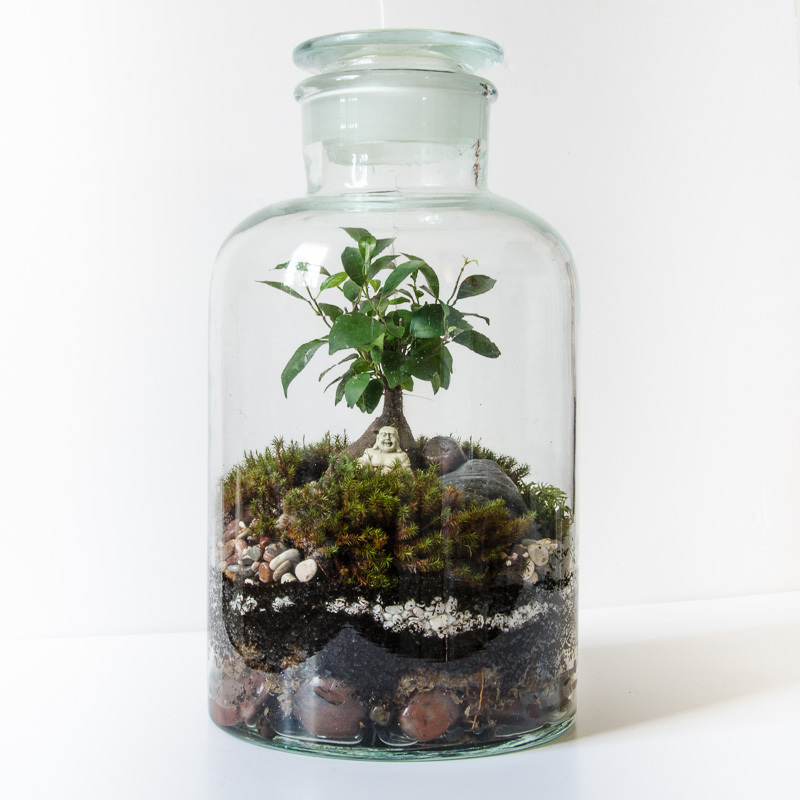 Terrariums are surprisingly easy to look after. All Happy Place Terrariums come with a care kit and instructions. 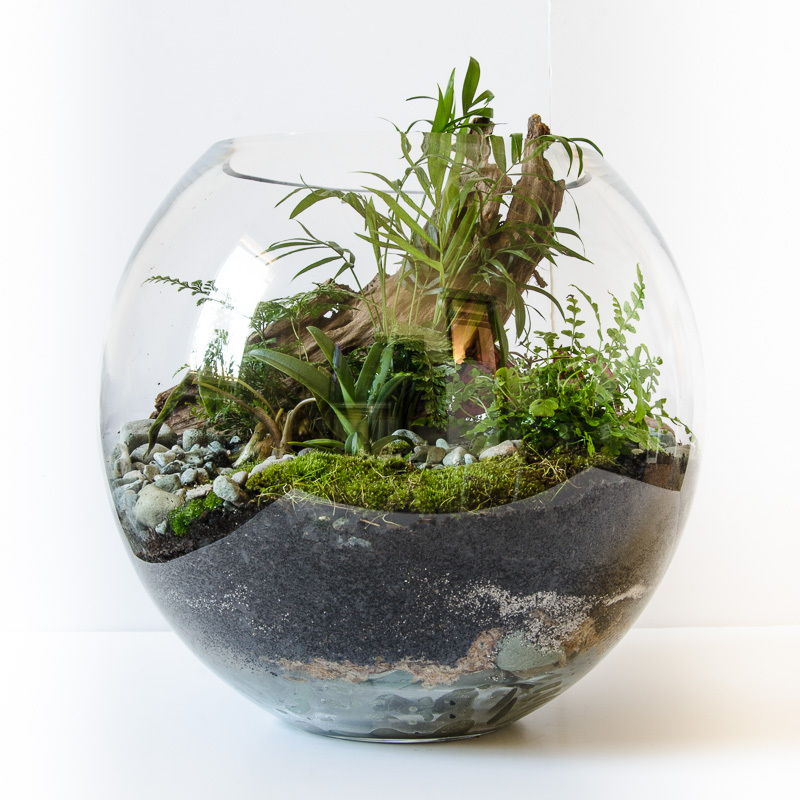 Here are a few tips to keep your terrarium looking good and green! Light: A nice bright spot, but out of hot, direct sunshine as it can burn the plants through the glass. Early morning and Winter sun are great. Succulents thrive with lots of hours of natural light. Upkeep: Keep your terrarium looking good by getting rid of dead leaves (very normal as succulents grow from the top).If a plant is getting tall and spindly, trim the top leaves so it fills out. If a whole plant dies (usually from over-watering), make sure you remove it. You can replace it with a cutting, another succulent from a plant nursery, or collect some pebbles/shells and cover that spot. Airplants: If your terrarium has an airplant, mist it with a spray bottle at least once/week – make sure it dries out within a few hours – if it stays soggy it could rot. Insects: Happy Place terrariums are chemical free, and sometimes tiny gnats take up residence. If you prefer to get rid of them, mist insecticide (pyrethrum is good) onto a cotton wool ball, cover the terrarium with glad wrap and leave in overnight, repeating the process after a few days. Light: A semi to bright spot, but out of direct sunshine as it can burn the plants through the glass. Early morning sun is great. Water: The key is not to over-water your terrarium because it doesn’t have external drainage. A healthy drizzle of water over each plant once/week is a good guide. If the pebbles in the bottom of your terrarium become submerged in water, you are probably giving the terrarium too much – put it in a bright spot and don’t water for a couple of weeks. If your terrarium has moss, it will love to be misted with a spray bottle every few days. If you have an African Violet, water near the base and try not to wet the leaves. Indicators: If the stem is turning brown/soggy, the plant is being overwatered. If a plant looks droopy, it may be underwatered. 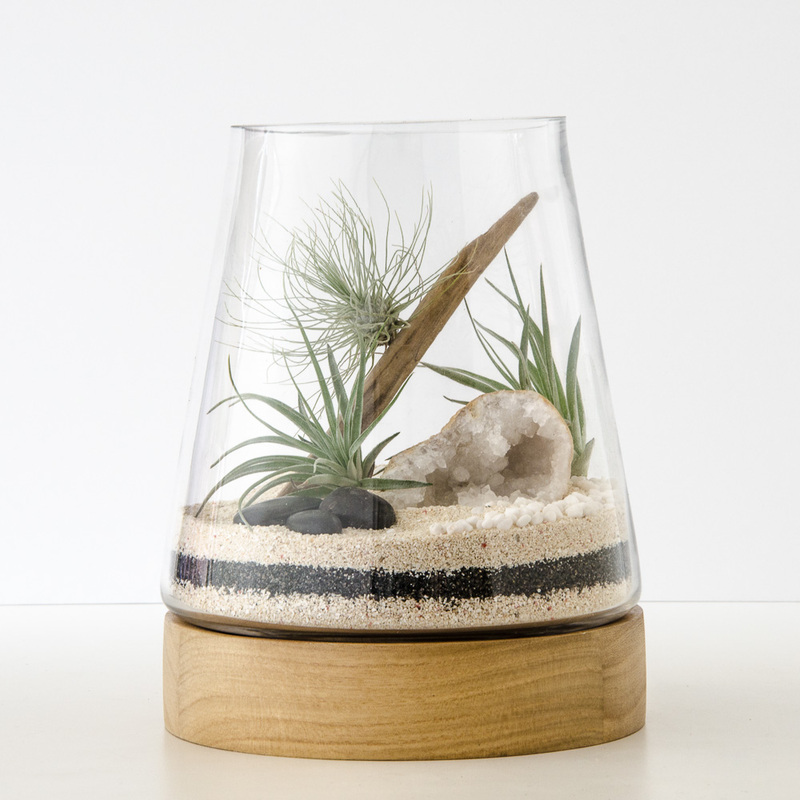 Upkeep: Keep your terrarium looking good by getting rid of dead foliage. If a plant is getting tall and spindly, trim the top leaves so it fills out. If a whole plant dies (usually from over-watering), make sure you remove it. You can replace it with a similar plant from a nursery, or just collect some pebbles/shells and cover that spot. Position: A semi bright spot, but out of direct sunshine as it can burn the plants through the glass. When you first put the lid on the terrarium, it will fog up, and gradually the fog will become water droplets on the glass. If you have had the terrarium for more than a month and the glass is always ‘sweaty’ on all sides, you may need to move it to a cooler spot. Make sure it is not in a position where it could overheat, eg an office with no open windows/aircon on the weekend in Summer. Water: Closed terrariums need very little water as they create their own water cycle – that’s why the glass has condensation. A few sprays of water when there is no condensation or your plant is looking droopy is a good guide – once a month, even more rarely for containers with a good seal. Leave the lid off after watering for half an hour – wait until foliage is dry before replacing the lid. If the glass has condensation droplets on all sides, it is too wet, so wipe down with a paper towel. Tip: use filtered, rain or distilled water to help keep your moss nice and green. 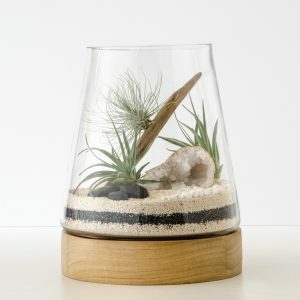 Air: Take the lid off for around half an hour, once a week to give your terrarium some fresh air. Upkeep: Pinch off or trim leaves as they grow and touch the glass so they don’t go brown. Clean internal glass if needed with a paper towel. Insects: Happy Place terrariums are chemical free, and sometimes tiny gnats take up residence. If you prefer to get rid of them, just soak a few cotton wool balls in pyrethrum insecticide, pop them in the terrarium (not in direct contact with the plants), put on the lid and leave overnight. Repeat after a few days. Fungus: Always remove dead foliage as it can attract mould and fungus. If you see any fungus, remove straight away with a tissue and leave the lid off overnight. If the fungus keeps coming back, add a teaspoon of 3% hydrogen peroxide (available at pharmacies) to your spray bottle of water, remove the fungus, spray the affected area and leave the lid off overnight. Don’t worry, the hydrogen peroxide won’t harm the plants, just the fungus! Light: A nice bright spot, but out of hot, direct sunshine as it can burn the plants through the glass. Early morning and Winter sun are great. If an airplant suddenly falls apart, it probably wasn’t getting enough light, so move your terrarium to a brighter spot. Water: Airplants do not have roots, so they get all of their water through their leaves. Mist them with your spray bottle around once/week, more often in hot weather or if they are exposed to heating or aircon. Make sure they are in a position where they can dry out completely as they can rot if they stay wet. Upkeep: Keep your terrarium looking good by getting rid of dead leaves and trimming the brown ends off leaves with nail scissors. Replacements: The beauty of airplant terrariums is that if the plants don’t survive, they are very easy to replace – just pop in a new one! If your terrarium has an airplant that is ‘suspended’ on driftwood and it needs replacing, gently twist it off the wood (I lightly adhere these with plant-safe glue so they don’t move during transit). Nestle a new plant in its place. Please contact me to arrange replacement airplants. At the end of the day, your terrarium is filled with plants, and is not destined to live forever. If an element of your terrarium dies, despite your best care efforts, it may just be the cycle of life in action. Plants can always be replaced. 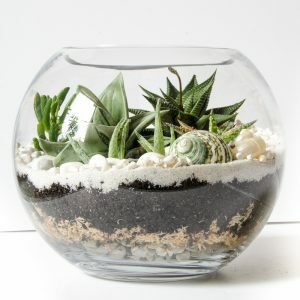 Or, if you decide to give up on your greenery, you will still have a lovely glass container that can be washed out and filled with, for example, shells, corals and driftwood. If you have any questions about caring for your Happy Place Terrarium, please contact me and I will do my best to assist.